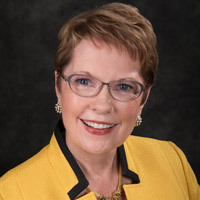 Webster University President Elizabeth (Beth) J. Stroble has been named to the LEAP Presidents' Trust, accepting an invitation from Association of American Colleges & Universities (AAC&U) president Lynn Pasquerella. The Presidents' Trust is a leadership group for the AAC&U’s Liberal Education and America’s Promise (LEAP) initiative, a national public advocacy and campus action initiative launched in 2005. LEAP champions the importance of a 21st-century liberal education—for individual students and for a nation dependent on economic creativity and democratic vitality. The Presidents’ Trust consists of presidents from all sectors of higher education who are committed to advocating for the vision, values, and practices that connect liberal education with the needs of the 21st century. The mission and work of the trust are grounded in the AAC&U’s LEAP Essential Learning Outcomes and in championing the value of liberal education and inclusive excellence as public advocates and campus leaders. "There is a palpable feeling among members of the Trust that the work it is doing is not only valuable but also particularly urgent given the current climate in higher education and national policy," Stroble said. "I am honored to join this leadership group and to represent Webster University on issues of national and indeed international importance." Webster Univeristy’s award-winning Global Citizenship Program (GCP) was conceived in part based on research and best practices from LEAP covering the diverse skills and experiences students need to succeed and adapt in the 21st century. In recognition of this Webster general education redesign, this fall the GCP received the Exemplary Program Award from the Association of General and Liberal Studies. Pasquerella, the AAC&U president who invited Stroble to the Trust, was on Webster's home campus in May working with faculty as keynote for the sixth annual Global Citizenship Program Collaboratory, an annual workshop that provides Webster faculty space to share and examine issues surrounding teaching and assessing deep learning educational practices. LEAP responds to the changing demands of the 21st century, including demands for more college-educated workers and more engaged and informed citizens. Members of the Presidents' Trust make a financial commitment, as well as a commitment of time and energy, to this important work. Stroble serves on several national and local boards of educational and advocacy organizations, as well as other non-profits, including the National Association of Independent Colleges & Universities. As a member of the Council of Independent Colleges Project for the Future of Independent Higher Education, she will host their forum in St. Louis in 2017. Learn more about President Stroble here.